Not a radish fan? 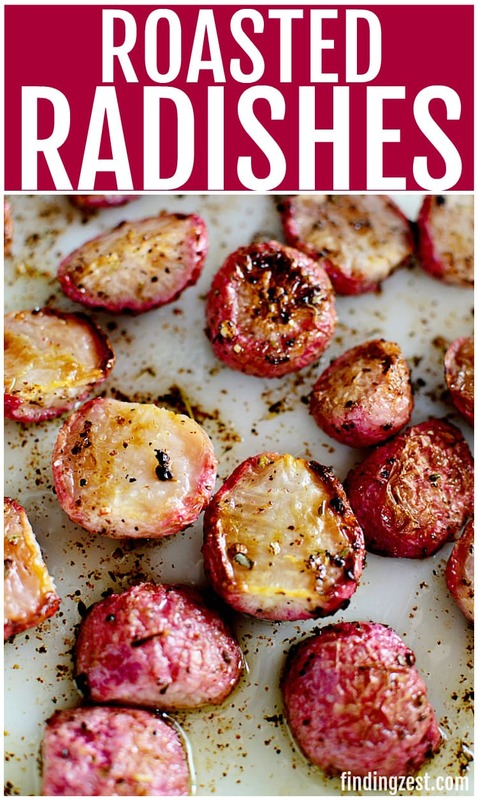 Try roasted radishes instead! As a kid, I had a fascination with and great aversion to radishes. They were such beautiful little orbs they had to be tasty, like carrots, right? But the unusual pungent flavor put me off when grabbing radishes from the veggie tray. As an adult, I’ve told myself countless times has to be more than radishes than raw crudité trays! Once I learned more about the health benefits and the other possibilities, I was determined to bring the radish to a new level. 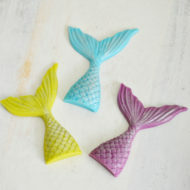 Want to know more about these little guys? Read on. 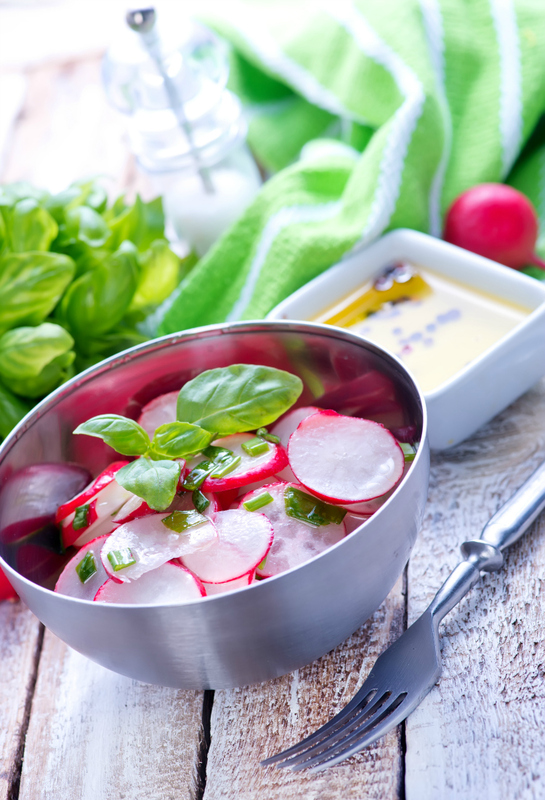 Innocuous on the veggie platter, the health benefits of radishes are rather amazing. They are a wealth of vitamins and minerals, including Vitamins A, E, K, B6 plus fiber, zinc, calcium and even iron. Radishes can help alleviate conditions such as jaundice, digestive upsets or urinary issues, heart problems, diabetes, and cancer. They even have anti-bacterial properties which can help with colds and other respiratory issues. In a pinch, you can use radish juice to soothe a bug bite, treat a fever, or wash your face. I’m not going to say they’re magic but pretty close. Plus, each radish offers no fat and nearly no carbohydrate in a one calorie package. 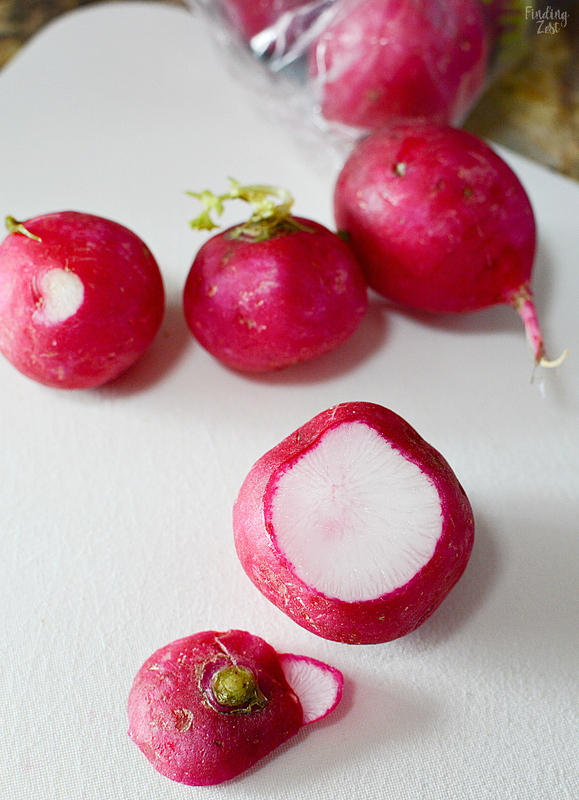 While you’re probably most familiar with the round red radish varieties, there are several different types of radish. Daikon, typically used in Asian cooking is a type of radish, and there are black Spanish, long French varieties, and the familiar horseradish. Sometimes it can be difficult to find the more unusual varieties even at specialty grocery stores, but farmers markets can be a trove of fresh radishes. 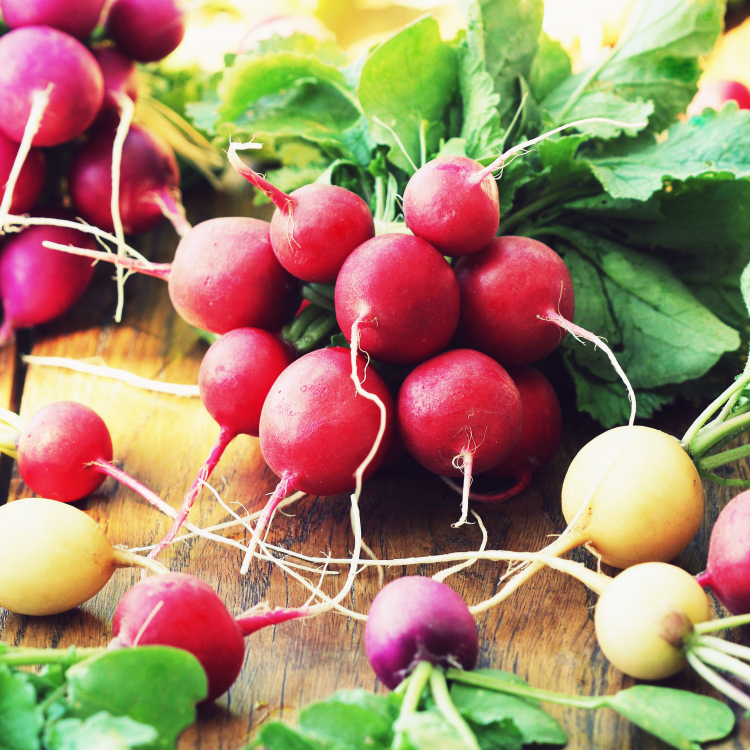 If that fails, you can easily grow your own array of radishes right in your garden! 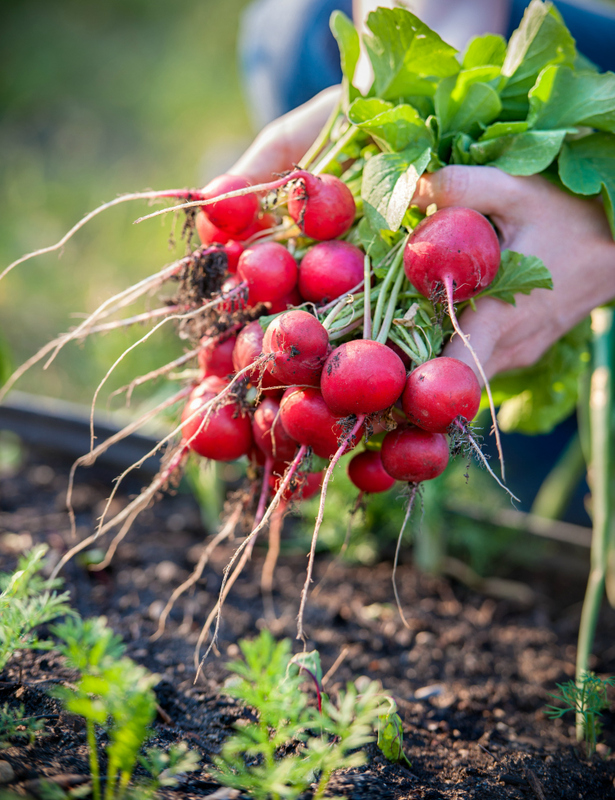 Radishes are low-maintenance, fast-growing crops you can enjoy all summer long. They typically love cool soil temperatures, so they are usually spring or early crops. However, depending on where you live, you can get in a fall crop as well, planting in August or September. Most spring/summer varieties are mature in 20 – 30 days, making them perfect for impatient gardeners (like kids!). There are also winter varieties that mature much more slowly, 60 – 120 days. For best success, plant in soil that isn’t too high in nitrogen – enrich your compost or soil with wood ashes, if possible. This helps repel bugs and maintain an ideal level of moisture. Radishes shouldn’t be allowed to become too dry but won’t thrive in overly wet soil. When it comes to eating, radishes are no one-trick pony. In the US we often eat radishes raw, but in other parts of the world, radishes are eaten after cooking or are used in a flavoring in soups or other cooked dishes. 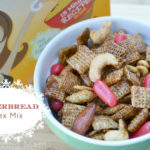 There are also plenty of unique radish recipes such as radish butter and radish chips. 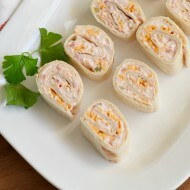 Other great ways to enjoy them are a radish salad or pickled radishes. While most of the time we eat the radish alone, the radish greens are also tasty. 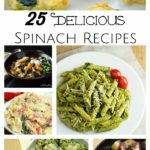 You can sauté them with the radishes themselves or chop them to enhance any salad. 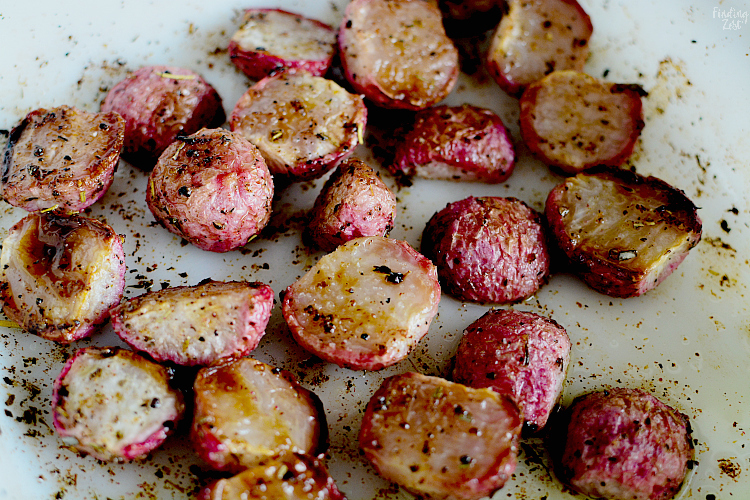 One of my new favorite ways to use up summer radishes is with roasted radishes. Joanne from The Salty Pot shared this recipe and finds the key to these radishes is a lot of seasoning, and getting a nice caramelization. 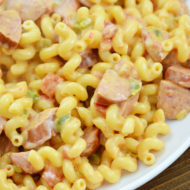 The more the “char” or “browning”, the tastier they will be. 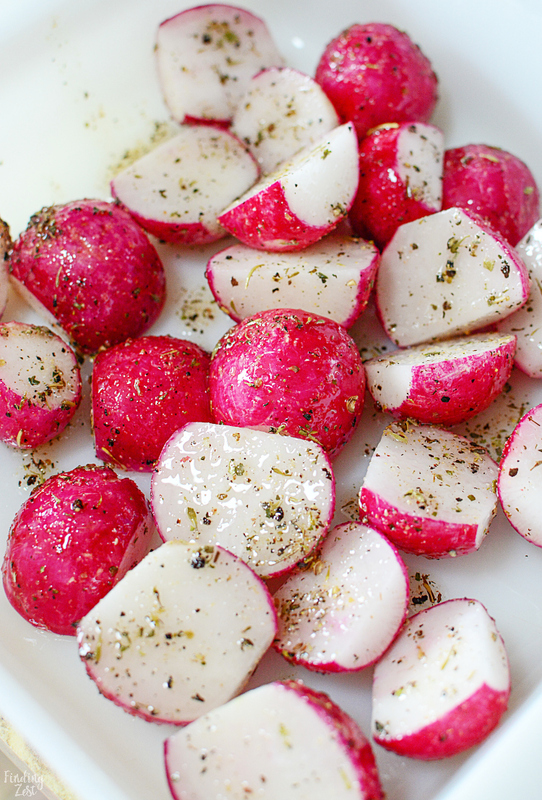 When they’re roasted like this, the spicy, peppery flavor of the radish goes away. 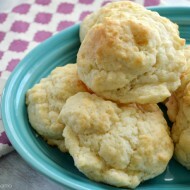 They’re divine when dolloped with a bit of sour cream. 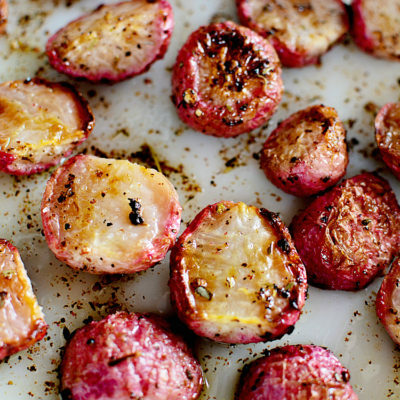 Roasted radishes are the perfect stand in for potatoes when someone is on a low carb diet. 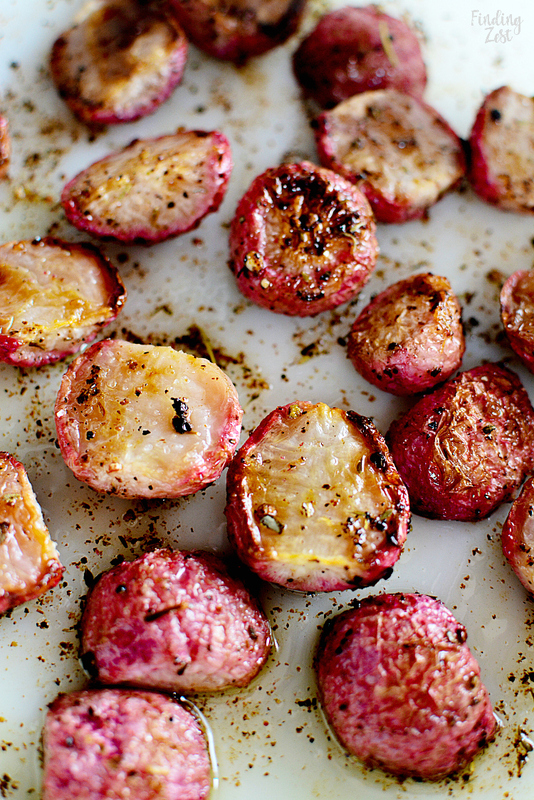 To make these roasted radishes, you’ll first need to wash and cut your radishes. In addition to cutting off both tips, you’ll need to cut them in half. 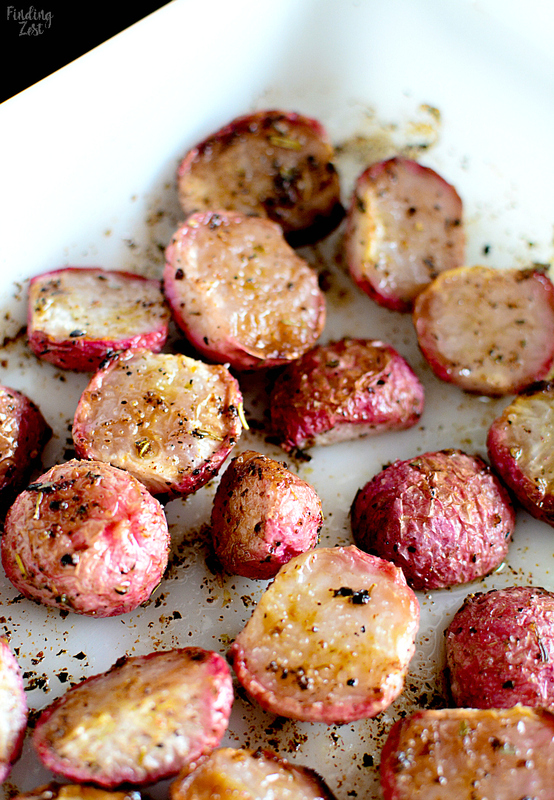 They look a lot like baby red potatoes like this, don’t they? Transfer them to a boil and drizzle with olive oil, garlic powder, Italian seasoning and salt and pepper to taste. 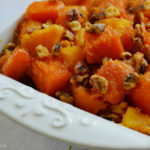 Spread them out on a baking sheet and bake for approximately 25 to 30 minutes minutes or until they are caramelized and tender. 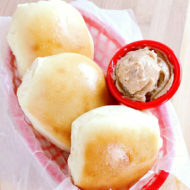 You can even add radishes whole to a slow cooker with a pot roast as they are a perfect substitute for the potato. While they might not be starchy like a potato, they give the look and idea of having a potato that we are so used to having with pot roast. 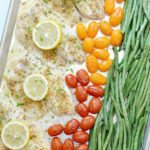 Place on a aluminum foil lined baking sheet or casserole dish with the cut side down. Roast for 25 - 30 minutes or until the radishes are fork tender, and golden brown. Before serving, adjust for seasoning (salt and pepper again). 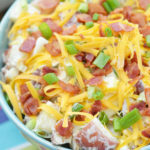 Garnish with a bit of sour cream and even bacon bits if you prefer. Love roasted vegetables? 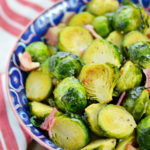 Try these roasted brussel sprouts with bacon! Hope you’ve learned more about the benefits of radishes and delicious ways to eat them. 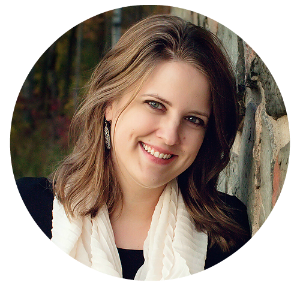 Andrea is juggling work and home while helping two kids grow up way too fast in Ohio. When she uncovers a moment of downtime, you can find her running, knitting, or making a to-do list. Having grown radishes my entire adult life, I have never considered roasting them. I will certainly try it out. Thank you so much for the the idea!! Now maybe I can get my boys to eat them. 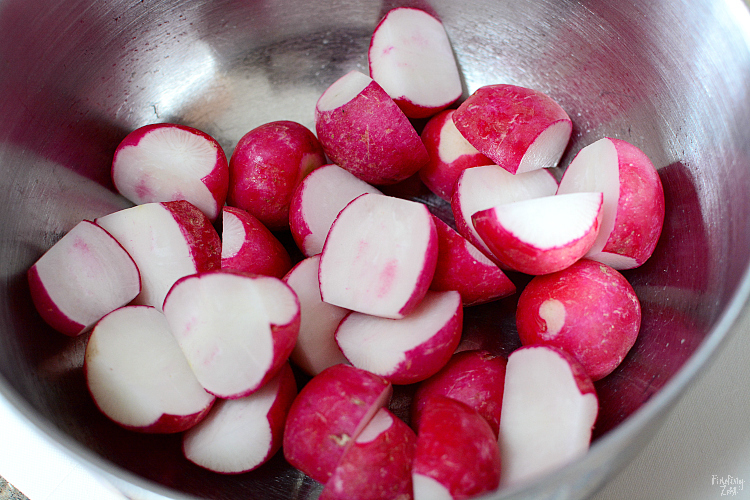 Going to roast them up with potatoes and a Kielbasa tonight for dinner, one of our favorites, but now with Radish! Have a lovely day! !